The human puzzle gets more mind-boggling as the pieces come together. Many of the pieces in this article have been hauled in from the dusty archives of museums and labs where scientists tuck away inconvenient evidence that clashes with the prevailing paradigm. The most reliable puzzle pieces come from ITC contacts received between 1985 and 2000 from superhuman beings calling themselves The Seven. As I assembled the pieces for this Human Story, this is the best timeline I can come up with for now. Disclaimer: To say any timeline is accurate, especially this one, is like trying to define the sun by its glimmering reflections on a mountain lake. Time is just an illusion of our world. The destruction of nearby planet Eden (Marduk) 4 billion years ago was a horrific event that, I suspect, may have “ripped the fabric” of space-time as we know it… so that trying to quantify the distant past scientifically would produce unreliable results at best. Still, modern science is the best tool we have today to define our illusory world, so this timeline looks at scientific and nonscientific evidence through the measurements of scientific dating methods. 13,700,000,000 (13.7 billion) years ago. The material universe was formed… bodies spinning in space everywhere… moving apart like shrapnel from an explosion… at the same time pulled together by gravity into clusters of debris… the clusters collapsing around the largest spinning objects into flat planes we call galaxies and solar systems. 4 to 13,000,000,000 years ago. 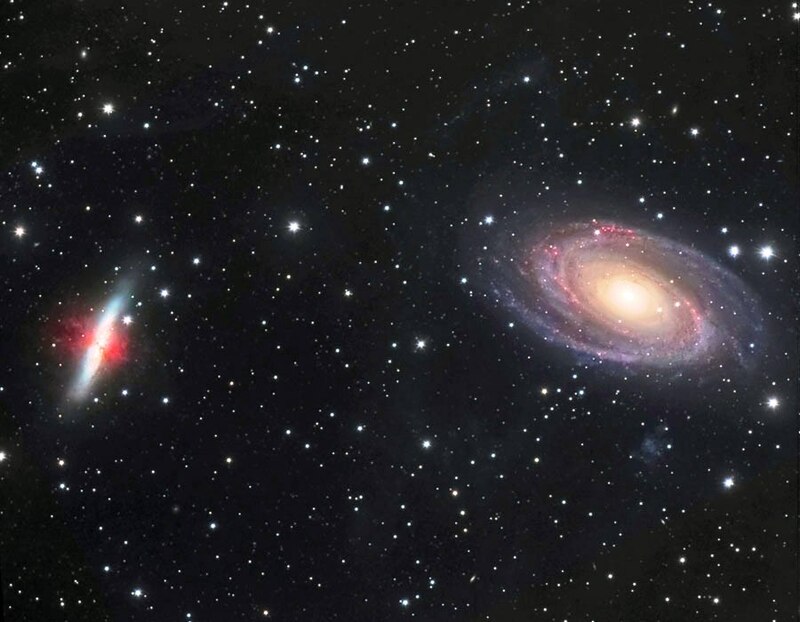 Our Milky Way galaxy and our solar system were formed, and a race of superhumans materialized from spiritual realms onto various planets, including a planet called Eden that orbited our sun between Mars and Jupiter. The Edenites set about establishing human civilizations on other nearby planets, including Earth. 4,000,000,000 years ago. Eden was destroyed in an explosion caused by the advanced technologies of the Edenites. Planetary shrapnel flew everywhere in our solar system, pummeling nearby planets and moons, destroying physical life on most of the worlds. The colonists on Earth became the last living Edenites and the ancient forerunners of modern humanity. It was a horrendous time for the castaways. Eventually the debris of Eden would settle down to form the asteroid belt… but for millions of years it swirled around the sun like a swarm of angry hornets, causing mayhem throughout the solar system. The castaways spent 3 billion years surviving under these hostile conditions… trying to forge a paradise-like environment here, similar to what they’d lost on Eden, but interrupted periodically by asteroid impacts that knocked the Earth off its axis, filled the atmosphere with dust, and generally kept the world in chaos. 3,900,000,000 years ago. 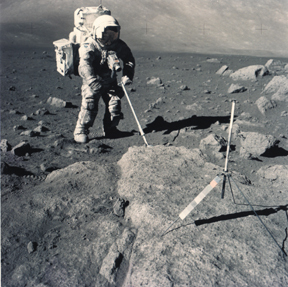 Rocks of that age found on the moon in the 1970s are most likely asteroids from the explosion of Eden that pummeled the moon. In the meantime, today there’s a growing body of evidence indicating human (Edenite) presence on Earth billions of years ago. 2.800,000,000 years ago. 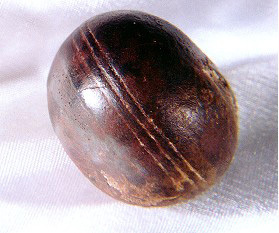 Researchers Michael Cremo and R Thompson write about hundreds of grooved spheres, about an inch (2-3 cm) in diameter, dug up in South Africa in the 1980s. Although science has offered some rubbery reasons for such spheres forming naturally in age-old Precambrian strata, many of the small items certainly have the appearance of being manufactured. The spheres were probably used in some way by the Edenite castaways long, long ago. 600,000,000 years ago. 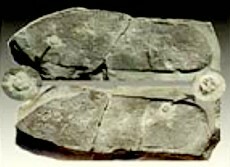 In June 1968 William J. Meister, a teacher and rock-hound, found a fossil of what seems to be a human sandal stepping on an ancient trilobyte in what is now Utah. Scientists reject the rock as a sandal-like impression created by natural causes, but hey, you’d almost expect to see a Birkenstock logo. 360,000,000 years ago. The paradise qualities fostered on Earth by the Edenites came to an end. In a 1987 ITC contact received by Maggy Fischbach of Luxembourg, superhuman Technician said, “The animal consciousness has been forced on humanity, humans themselves are not bad. Prior to the last ice-age men lived peacefully together, man with man and man with animals.” So, before the Karoo ice age began 360 million years ago, the Edenites lived at peace on Earth with each other and with the other inhabitants of Earth. That would imply that the savage side of human nature—the drama-possessed part of us that’s stirred up by fear, suspicion, and greed and drives the financial markets and the movies and generally stirs up strife in society—hadn’t fully developed among the humans living on Earth before the Karoo ice age began… but more noble people (Edenites) definitely were here at that time… if you believe the Technician… as I certainly do! 280,000,000 years ago. 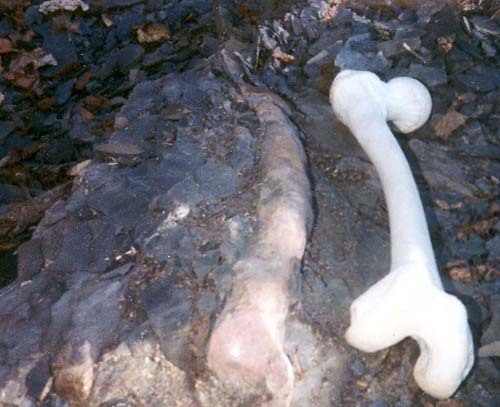 Researcher Ed Conrad discovered what seem to be petrified human bones and organs between veins of anthracite coal in Pennsylvania. Coal was formed in the Carboniferous period some 280 million years ago, which means that the original owners of those bones and organs must have lived and died at that time. Again, scientists for the most part shrug off the findings with natural explanations, but I’ll give Ed the benefit of the doubt. I have no doubt whatsoever that human remains got caught up in the sludge that became coal. 250,000,000 years ago. 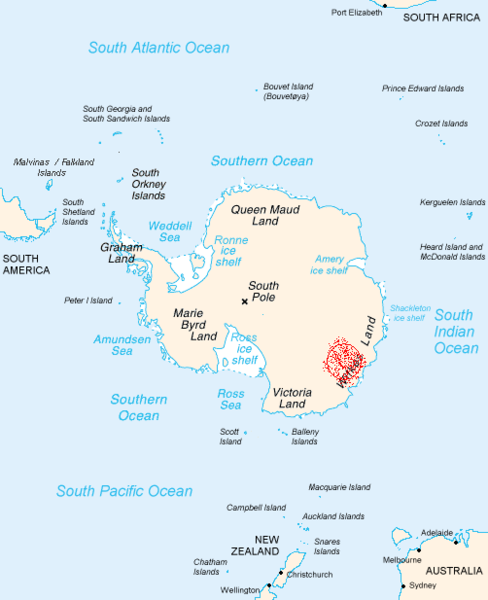 The Wilkes-Land crater in Antarctica was formed, probably by debris from Eden that had been swirling around in our solar system for 3 billion years before colliding with the Earth. The collision probably forced the Earth to shift on its axis. 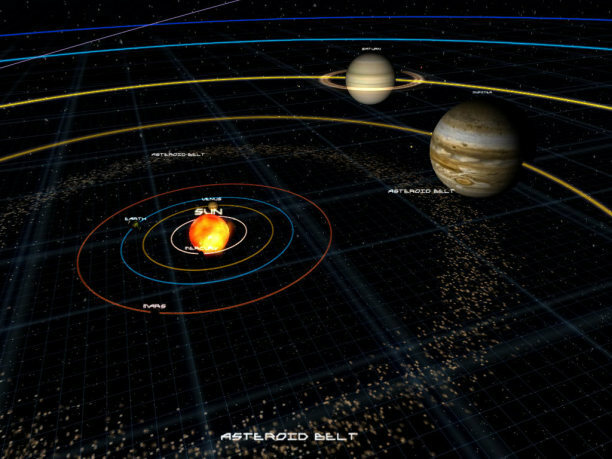 You see, by then most of the asteroids would have been pulled into the plane of our solar system, in which case they would hit planets somewhere in the middle, not on the bottom or top… and since this crater is now on the bottom of the Earth, it’s almost certain that Antarctica was somewhere in the middle of the planet at the time of impact. In any case, that asteroid impact brutalized the global ecosystem, causing the worst mass extinction our planet has known, since the original destruction of Eden. 230,000,000 years ago. Dinosaurs emerged from the chaos, some 2 million years after the asteroid’s impact. 65,000,000 years ago. 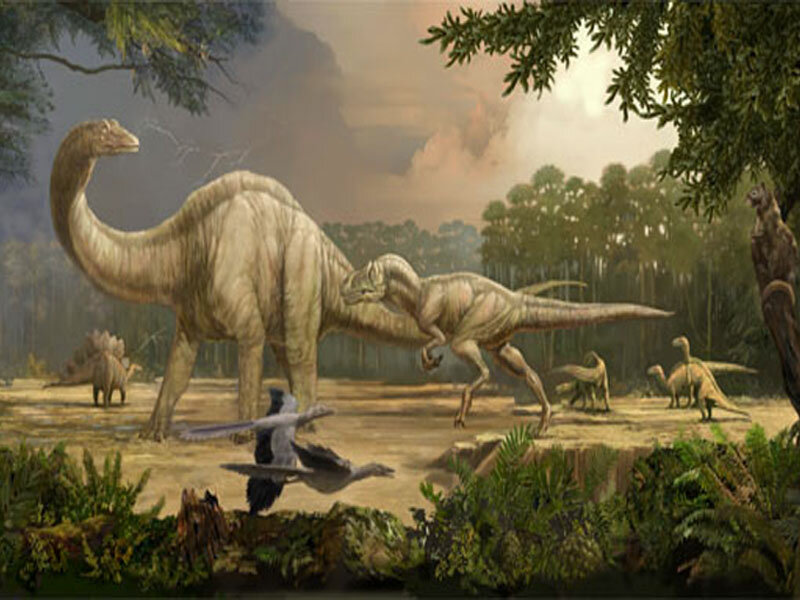 Dinosaurs died out around this time, when another asteroid impact created the Chicxulub impact crater in Mexico and caused another mass extinction. There’s some really “hard” evidence that humans were alive during the time of the dinosaurs. Stones etched with detailed pictures of people and dinosaurs date back at least 65 million years. 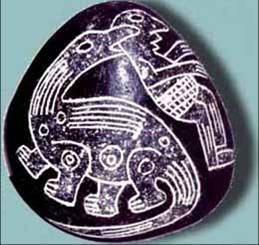 Tens of thousands of these stones have been found in Peru, near the desert town of Ica, with ancient carvings showing people fighting dinosaurs, performing modern surgeries, and watching Eden’s wayward comets through telescopes. The Ica stones are dark volcanic andesite, as hard as granite, ranging from baseball-size to chair-size. Long, long ago when humans came to Earth from Eden (or Marduk), they lost mastery over nature after their dissension with the serpent…. Humans had to fight against nature and some of its most dangerous creatures. You call them monsters, but they were only life forms which defended themselves and their kind. These creatures did not subject themselves to the intellectual superiority of humans and had to be defeated and destroyed by cunning and strength. Human civilizations prevailed… We know that many among you will not believe us. This does not bother us. We know that this is how it was. Today you may consider it science fiction, but you too will one day, once more, recognize its validity. I interpret it to mean 1) Edenite colonists became marooned on Earth when their home planet was destroyed 4 billion years ago, 2) they spent several billion years managing the world with some success, and 3) they lost out 250 million years ago when an asteroid impact caused the largest mass extinction… and after that humans had to contend with dinosaurs for millions of years… and it was that event that made way for the first epoch of modern humanity—the civilization of Atlantis. The “fall of Man” is a legend handed down from Greek mythology. It was maintained by the “Mysteries” and found its way into the schools of philosophy during the Greek classic period. Humans were considered to be descendants of Titans who had killed the young Dionysus-Zagreus. The burden of this crime weighed heavily on them. In a writing by Anaximander it is said that the unity of the world was destroyed by a prehistoric crime. In reality, these legends are based on a factual incident: the downfall of the civilization you often call Atlantis (also known by other names). This downfall was brought about by the descendants of the last inhabitants of Marduk who became marooned on planet Terra. This downfall came through reliance and blind trust in a massive technology. Based on other information we’ve received through ITC contacts, I interpret the above message to mean 1) over millions of years the Edenites were involved in genetic engineering and cross-breeding to create various races of humans, 2) the first generation of descendants were what we today refer to as Titans or gods (suggesting that the Edenites themselves must have been, like, supergods), 3) those god-like descendants of the Edenites were still alive during the time of Atlantis, and 4) it was the destruction of Atlantis that was the “fall of man”… when the Titans finally left the Earth, and we animalistic humans at last became troubled stewards of a troubled world. More on the Edenite castaways long ago and the superhuman spirits involved with our world, in the next two articles in this series. This entry was posted in Heaven and Earth, Humor, ITC, Other-worldly matters, Our ancient heritage, Our paradise destiny, Science and Technology, Society and ethics, Spiritual realms and tagged asteroids, Atlantis, bones in coal, craters, dinosaurs, eden, fall of man, gods, grooved spheres, human origin, ica stones, marduk, mass extinction, Meister sandal, titans. Bookmark the permalink.